Welcome to CAMP JCC! our mission at camp jcc is to provide a wonderful camp experience, with your child’s safety and well-being as our number one priority. our camp staff participate in intensive and comprehensive training sessions, and have experience working with children. we ensure that each staff member is well supported each week. please take the time to look through this brochure and familiarize yourself with our outstanding and unique programs. feel free to contact us if you need help determining which camps are the best fit for your child. get ready for nine super weeks of fun, developing friendships, and turning moments into memories that will be forever cherished! on behalf of the camp jcc staff, we would like to welcome you to summer camp! for any questions you may have, please contact us at camp@cjcc.ca. •	We pride ourselves on our diverse programming, catering to a range of interests. •	Our staff are well-trained and dedicated to providing a safe, fun environment for your children. •	Our facilities offer the opportunity for a wide range of programming, including our indoor swimming pool, specialty instructors and field trips each week. LUNCH OPTION Main dish, fruit / veggie, cookie, and drink is provided by Karenâ&#x20AC;&#x2122;s CafĂŠ for an additional fee of $50 per week.1 Week 1 and 6 lunch option is $ 40 due to a short week. week 1*• july 2-5•m/$209 p/$226 code: 5972 • 5992 • 6016 Not sure which weeks of camp to choose from? Have no fear, let’s kick off the summer with a little bit of everything! We will sample different activities from all of our exciting themes and create one awesome week of camp! code: 5978 • 5997 • 6018 Let’s soak up the sun and explore the great outdoors together. We’ll hop from park to park and visit the amazing playgrounds this city has to offer. Each day is an out-trip to a different play area for some fun in the sun! week 2•july 8-12•m/$261 p/$282 code: 5989 • 5990 • 5977 Everyone’s favourite board games become a lot more fun when they are supersized! This week of camp will create jumbo variations of classic boardgames and create new games and activities inspired by trending favourites! week 6* • aug 6-9• m/$209 p/$226 code: 6020 • 5980 • 5998 Lights, camera, action! This drama filled week will teach campers the skills necessary to make it in the world of performing arts. From singing and dancing, to acting and filming, it is time for your inner star to shine! week 3• july 15-19•m/$261 p/$282 code: 5976 • 5991 • 6006 Good luck, travel safe, go! It’s time for the most amazing race that Camp JCC has ever seen! Team work and thinking outside of the box will be necessary for solving clues and completing challenges during this fun-filled week. week 7 • aug 12-16•m/$261 p/$282 code: 5981 • 5964 • 5967 What did the limestone say to the geologist? Don’t take me for “granite!” We’ve got more where that came from, so put on your thinking caps and get ready for a week full of wicked experiments, ooey gooey slime, wondrous discovery, and science fun! week 8 • aug 19-23•m/$261 p/$282 code: 5973 • 6010 • 5969 Let’s go back to a tyran-iffic time when dinosaurs ruled the world! Discover what it’s like to be a real paleontologist as we uncover prehistoric wonders. week 9 • aug 26-30•m/$261 p/$282 code: 5986 • 5993 • 6001 Let’s throw some paint at the canvas and see what sticks! This art-filled week includes painting, sculpting, sketching, and so much more. Be ready to unleash your inner artist. week 1*• July 2-5•m/$209 p/$226 Code: 5971 • 6012 • 5982 Summer Sports Camp is now in session! Time to put down your pencils and unlock the equipment room. We’ll play traditional ball sports (basketball, football, soccer, etc. ), as well as sports that campers may not have tried, such as bocce ball, cricket, and water polo. week 2•july 8-12•m/$261 p/$282 code: 5994 • 5985 • 5988 Clean off your bike and let’s ride – we are hiking and biking during this adventure-filled week around the Glenmore Reservoir. Bikes can be stored at camp during the week. Prerequisite: Children must be comfortable riding a two-wheeler. Required: A bicycle in good condition and a helmet that fits properly. week 3• july 15-19•m/$261 p/$282 code: 5995 • 5962 • 6002 Let’s hang loose and catch some waves in this aquatic adventure! Get ready for a week of water sports, waterslide, and of course, water fight fun! code: 6015 • 6017 • 5963 The epic-ness never stops! This week is full of all those cool activities you know and love. Laser tag, fort building, capture the flag, and more big group games – as epic as they come! week 6* • aug 6-9• m/$209 p/$226 code: 5984 • 6023 • 6004 Hockey or soccer? Baseball or tennis? You can have your cake and eat it too! We will combine our favourite sports to create our very own JCC super sports! This fun twist on conventional games will give our campers an experience they’ll never forget! week 7 • aug 12-16• m/$261 p/$282 code: 6022 • 5970 • 6007 Try something new in this week filled with unique instructors and activities. This camp includes yoga, martial arts, healthy cooking, and other fun and holistic activities. week 8 • aug 19-23•m/$261 p/$282 code: 5968 • 6003 • 6013 Let the games begin! Your agility, team building, and coordination skills will be put to the test as groups face off in a variety of fun competitions. week 9 • aug 26-30•m/$261 p/$282 code: 5966 • 5996 • 5965 A sports-themed week decided by you! Registrants will be surveyed prior to the camp to find out the best activities. Jam all of those into this thrilling week, and you get the best of the best in games and activities. TOSSING THE TRAINING WHEELS week 2 • july 8-12 • m/$340 p/$380 • code: 6043 week 8 • august 19-23 • m/$340 p/$380 • code: 6044 9:00am - 4:00pm • ages 4-6 It’s time to get rid of those training wheels and learn to bike! This program is designed to transition your children from four wheels to two, help them develop confidence, while introducing biking concepts centered around technique and safety. Bikes can be stored at camp during the week. Traditional camp activities will be blended with the biking curriculum. Required: A bicycle in good condition and a helmet that fits properly. TACKLING THE TRAILS week 2 • july 8-12 • m/$340 p/$380 • code: 6041 week 8 • august 19-23 • m/$340 p/$380 • code: 6042 9:00am - 4:00pm • ages 7-10 For those children already confident on their bike, this program aims to get your children further experiencing the joys of cycling. Prepare for adventure and exercise as we bike off-site and ride some of Calgary’s trails. Bikes can be stored at camp during the week. Traditional camp activities will be blended with the biking curriculum. Prerequisites: Children must be comfortable riding a two-wheeler. Required: A bicycle in good condition and a helmet that fits properly. TINY TUTUS & HAPPY HIP HOPPERS week 4 • july 22-26 • m/$180 p/$206 • code: 6047 9:00am - 12:00pm • ages 4-6 Come dance with us! This fun camp will encompass many styles of dance including Jazz, Ballet, Hip Hop, Tap, Acro, and Musical Theatre. We will explore different movements with music and also incorporate our own instruments to create original music to get our groove on! Also included in this camp will be crafting, drama games, and a daily snack break. The week will end with a performance for all parents! BROADWAY BOUND week 8 • August 19-23 • m/$221 p/$247 • code: 6036 9:00am - 12:00pm • ages 8-12 Open the curtains and explore this camp incorporating different styles of dance set with music and singing from several famous musicals. We will focus on character development, acting, spacial awareness, partner work, and choreography. Participants will create and build a costume to keep. The work we do during the camp will be displayed in a performance at the end of the week. EXTEND YOUR CAMP EXPERIENCE INTO A FULL DAY! SCRATCH CODING WITH LEGO WEDO ROBOTICS1 week 3 • july 15-19 • m/$185 p/$205 • code: 6045 9:00am - 12:00pm • ages 8-12 Bring LEGO® Bricks to life with coding! The ability to code is a key component of technology education today. This camp will teach campers important strategies to enhance their logic and problem-solving skills, as well as help them work toward becoming technological innovators of tomorrow. Participants will build models with LEGO® Education’s WeDo elements/sensors, then control their models with the Scratch codes they write. Campers will also engage in creative maker space and building games/challenges. VIDEO GAME DESIGN1 week 3 • july 15-19 • m/$185 p/$205 • code: 6046 1:00 - 4:00pm • ages 8-12 Campers will develop a range of coding and problem-solving skills as they create fun video games. Game designers will think creatively, reason systematically, and work collaboratively to create various video games. Each Game Design unit includes a themed mini-model built with LEGO® Bricks that will be the main character of all of the games. Each game progressively teaches more advanced capabilities within the video game design software. Participants will be proud and excited to actually play their very own completed video games. BRICK ROYAL2 week 9 • august 26-30 • m/$170 p/$190 • code: 6037 9:00am - 12:00pm • ages 5+ Skydive down from a flying bus into a world of brick building! Imagine living in this brick world for a fort night, and working on a fun mission while you’re here. Campers will love building popular game characters, llamas and motorized character models that really dance! This fun, game-based camp focuses on the fun of creating, building, navigating, and teamwork. BUILDING IS AWESOME2 week 9 • august 26-30 • m/$170 p/$190 • code: 6038 1:00 - 4:00pm • ages 5+ Join Emmet, Lucy, Unikitty, and Benny on a journey to stop Bad Cop and Lord Business from super-gluing the world. Campers will put their creativity and engineering skills to work as they build motorized technic machines, 3D figure models and mosaics based on The LEGO® Movie and its sequel. Whether you take an imaginary ride on Metal Beard’s ship or Emmet’s double-decker couch we are sure you’ll agree everything is awesome! REGISTER IN BOTH CAMPS FOR A FULL DAY BRICKS 4 KIDZ EXPERIENCE! REGISTER IN BOTH CAMPS FOR A FULL DAY BRICKS 4 KIDZ EXPERIENCE! 1.	half-day camps run from 9am to 12pm. full-day camps run from 9am to 4pm, and includes a one hour lunch break. pre-care is from 8 to 9am and post-care is from 4 to 6pm. 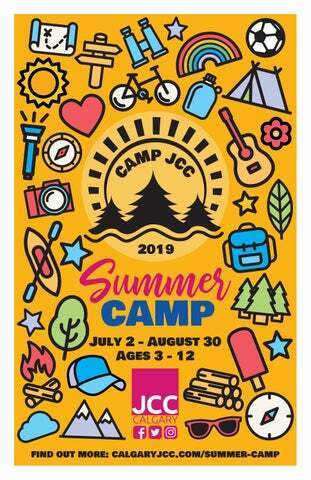 2.	online registration available at mycalgaryjcc.com starting march 25. registration form must be completed and emailed to camp@cjcc.ca or dropped-off at the jcc customer service desk to confirm registration. 3.	payment plans are available upon request. all fees must be paid prior to june 28, 2019. please set up a payment schedule with the jcc customer service desk. 4.	early bird discount available for general and sports camps (see page 3 – discount ends march 24). discount does not apply to specialized camps, pre-care, post-care or karen’s café lunch. 5.	if withdrawing from a camp session a minimum of five business days written notice must be provided. no refund will be provided with less than five days notice. a 20% administration fee will be charged to all withdrawals. 6.	if a camper withdraws during the camp session, no refund will be given. 7.	no refunds will be given for absences during camp session. 8.	each camp group requires a minimum number of campers to operate. camper groups may be blended to ensure requirements are met, or may be cancelled. 9.	member prices are not available for children of families holding individual or senior memberships. member prices are available for families with a valid membership for the week they are attending. 10.	please bring a hat, bathing suit, towel, sunscreen, snacks, and a labeled water bottle every day. 11.	lunch must be brought from home, unless registered for the lunch option (see page 3). 12.	we are allergy and kosher sensitive. if you are uncertain as to what foods are acceptable, contact our jcc camp director at 403-537-8598 or camp@cjcc.ca. our zero tolerance policy exists to protect our campers and leaders against violence, bullying, name calling, teasing, etc. at camp jcc we do not want to see any camper dismissed for behavioral reasons. we make every effort to work with day campers and their families, allowing them the opportunity to correct their mistakes when they are misbehaving. however, we do have a zero tolerance policy for campers committing excessive verbal or physical abuse towards campers or leaders. this behavior would include: hitting, punching, kicking, or other forms of fighting, verbal threats of violence, and excessive name calling and swearing. furthermore, any camper caught stealing or damaging another person’s property will also be subject to our zero tolerance policy. these previously mentioned behaviors will not be tolerated and may result in expulsion for the remainder of the camp session. *email is required to receive camp newsletters and schedules. No time to make lunch for your camper? We can help with that! Turn to page 3 for details. 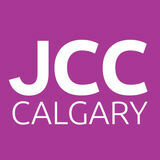 Calgary JCC has partnered with Between Friends to offer an inclusive experience to campers of all ability levels. Please let us know how we can help to support you to be successful at our camp.